Mr Pheng has been a tuk tuk driver, taking visitors around the World Heritage Angkor Wat temples for more than seven years. His knowledge of the area is second to none, as his customers attest. From watching sunset over ancient temples away from the crowds, to discovering hidden lotus fields and being presented with lotus flowers, to being introduced to local artisans, Mr Pheng shows you a side of Cambodia that you might otherwise miss. He also knows the best restaurants, and can help you find the perfect present or souvenir to take home. But more than that, Mr Pheng is the kindest, smiliest man who wants you to have the best possible experience of his country. We were so impressed by Mr Pheng, and have such wonderful memories of our time being shown around, that we want to share that with you. 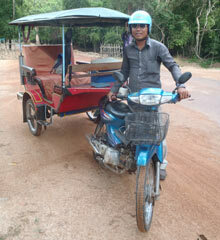 "I am tuk tuk driver for seven years. Before I was driver I was monk in wat sway dangkom Pagoda. After that I was farmer with my mother for three years. Now I am tuk tuk driver and it is the best job of all. I meet the many customer from different country when they travel with me. They are always so happy every time with me. I want to know many customer from different country. I like to show them beautiful temples at the Angkor Wat. I think the best in world! I want to practice English with visitor and I realize that the Siem reap city is the place tourist want to come. I think that this job is very good because I can get some money to support my daughters to study. Please have a good luck to you and your family and your friend every time !!"